Is this a genuine antique Majolica vase? So, does my photo show an antique Majolica vase or something else altogether? My family is currently cleaning out my grandparents’ house and we found this vase. We’re not even sure if it’s a vase since it is so short, but my aunt seemed to think it was a piece of antique Majolica pottery. They have given me the job of finding out what it could be worth and whether it is worth trying to sell it. But, as a 20 year old with no knowledge of pottery or antiques, I am finding it rather difficult. It is a dark teal with other lighter pastel colors, and it looks identical on the other side. The bottom is pretty unremarkable – it has a 5 digit number stamped into it, as well as a roman numeral 3 underneath that. To the side of that is what looks like a backwards C which was drawn on in some kind of pen or marker. Those are the only markings on the bottom, so if anybody could provide any information or helpful sources, it would be greatly appreciated! I have got one that looks the same (little bit different), however mine is accompanied by two majolica vases. On the bottom there are numbers, on one vase 8200 and 3. On the other one 8201 and 3. They are Majolica vases, which is all I know. 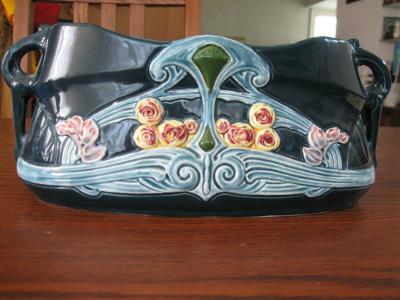 Hi Carrie, Your piece looks like German majolica circa 1890 to my eye. A likely candidate might be Eichwald but their impressed numbers were never five digits. Other German makers who definitely did not make this piece: Bernard Bloch, Walter Schiller, Villeroy & Boch, Julius Dressler, Reichard Krause, Schramberg, Hugo Lonitz. I’m afraid you got me beat on this one.